West Midlands Police said the incident happened at approximately 8.20am on Friday morning (24th), when a man in a silver car pulled alongside the girl in Slater Road near the junction with Mill Lane, Bentley Heath, and asked her to get in. She immediately said “no”, then ran off and alerted her school, who called police. The driver of the car is described as having no facial hair, lightly greying and possibly wearing glasses. 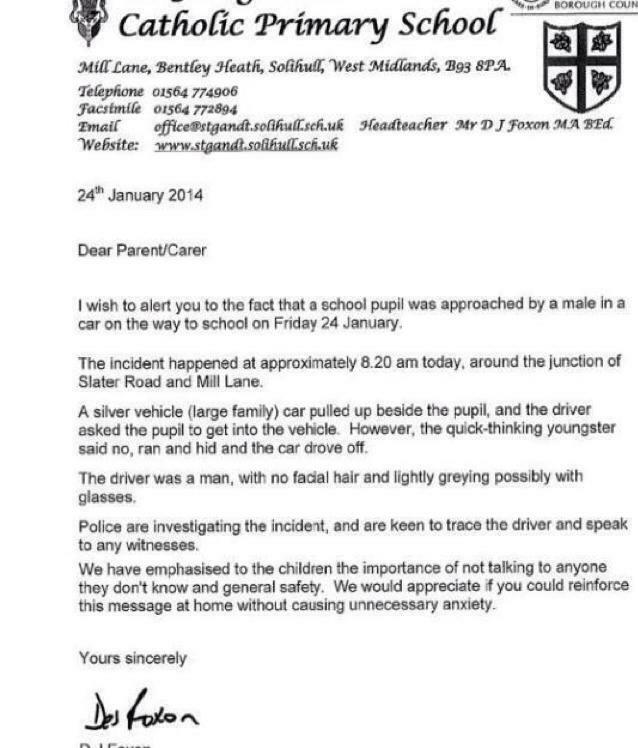 The girl’s school has not been identified but other local schools sent warning letters or emails to parents yesterday. Police said officers were working together with Solihull Council to reassure parents and advise of the need to be vigilant. Police are investigating the incident and are keen to trace the driver and speak to any witnesses – if you have any information, call Solihull Police on 101.